Welcome to Flying Change Farm, breeders of quality Trakehner and Trakehner cross sporthorses. 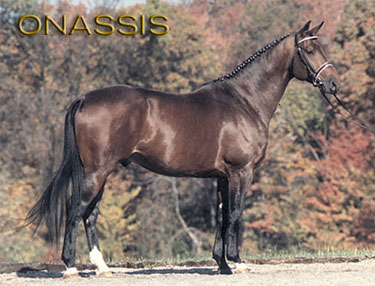 We have retired Onassis from breeding. If you would like the bloodlines you should consider his approved son, Tatendrang. To see what kind of foals we produce, click Foals. You can then also click on a foals picture for more photos and information. For a listing of sale horses, click Sale Horses. Information on how to directly contact the owners is provided. Please also explore our site for information on the Trakehner registry, our fees, stallion contract forms and how to contact us! Site designed and produced by Infinity Design Group & Pam Norton.